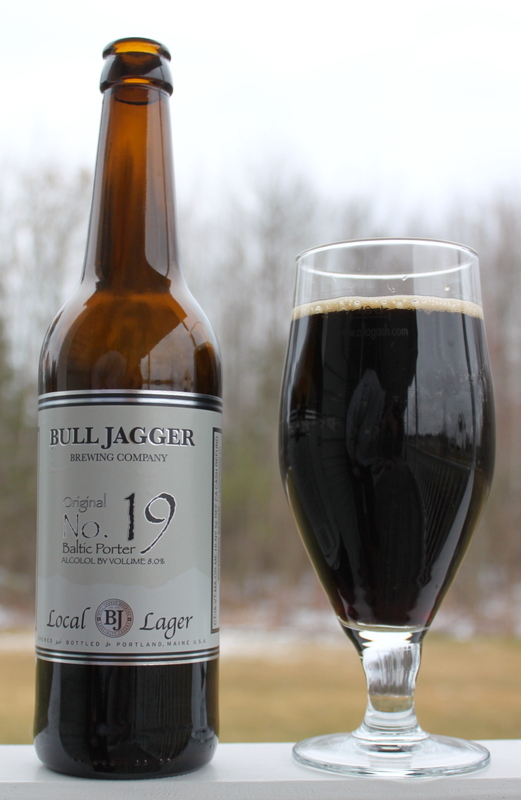 Bull Jagger is a new brewery based out of Portland, ME that focuses on lagers. I saw their Baltic Porter in the store, and decided to give it a try. I have not had many Baltic porters, the one that stands out in my mind is Smuttynose Baltic Porter which I enjoyed very much. On to the tasting! Appearance: Black, with red highlights at the edges. Low carbonation, only about 1 finger, and it falls to just a rim quickly. Yeast on the bottom, so I suspect bottle conditioned. Aroma: Roasted notes mostly, coffee, with some chocolate that comes out more as it warms up. Some malt sweetness. No alchol, no esters, no hops. Taste: Round mouthfeel. First I taste the roasted flavors, coffee mostly. There is more of the bitter chocolate notes as well as it warms up, matching the nose. It is not overpowering, more subtle. You get some nice sweetness from the malt next, and a crispness that I usually associate with lagered beer. Not much as far as esters. Finishes with a touch of sweetness, but there is a smooth bitterness on the back that balances everything. Critique : I like it. The roasted flavors are pretty restrained. It has that crispness you get from lagers, but there is a decent mouthfeel to it. They hide the 8% ABV well, I don’t taste it or smell it. I admit I have not had many baltic porters, but this one is pretty good, more restrained on the roasted notes then others I have had. I would have this again, but at 8%, this is an occasional beer.